Late last week it was revealed that the beard from King Tut's burial mask was hastily glued back on with epoxy after being accidentally knocked off by a maintenance crew. After inspecting the priceless artifact, a German restoration specialist says it can probably be fixed. 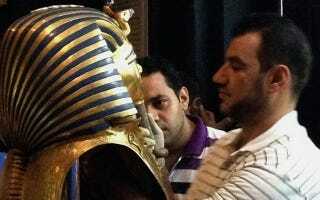 Above: A photo from August 12th, 2014 by the AP's Jacqueline Rodriguez showing a member of the restoration crew gluing the beard back on the mask at the Egyptian Museum in Cairo. We have some more information for you about this incident, both in terms of what happened and what's going to happen next. First, it appears that a maintenance crew knocked the beard off the mask in August 2014 while attempting to change a light bulb in the glass case where it's kept. Then, in a hasty decision, five of the museum's curators were tasked with putting it back on. However, they chose an epoxy, which is an extremely strong adhesive normally reserved for fixing plastics and ceramics — and most certainly not something to be used when restoring priceless artifacts. If this wasn't bad enough, the team squirted too much on. In desperation, they tried to chisel away the excess glue (allegedly with a spatula — and even sandpaper), leaving a blotch of "transparent yellow" under the chin of the mask. To make matters worse, the chin was put on crookedly and it appears the gold has been scratched. "The five people assigned to re-attach the beard clearly lacked experience," noted Abdel-Hamid al-Kafafi, who's with the antiquities ministry committee investigating the incident. "We have taken samples of the glue to know what exactly was used and if it is repairable." Needless to say, people are outraged. As the New York Times is reporting, Monica Hanna, an archaeologist with Egypt's Heritage Task Force, wants the Egyptian officials charged for damaging the burial mask. "There will be a committee of experts consisting of conservators, archeologists and natural scientists in order to develop a plan for re-conservation," he said. "Up till now we found one scratch which is visible but it cannot be said now whether this scratch is an ancient one, a recent one, or a modern one which just happened right now," he added. [...] Museum administrators at the news conference declined to comment on which specific type of epoxy was used. Experts say adhesives used in such repairs are chosen for their reversibility, for which epoxy is not renown, although the difficulty of its removal varies according to the type of resin used. The experts' optimism is obviously cause for celebration, but given that all the details aren't in yet, we'll have to wait and see how effective the restoration effort will be.